The car which would become Public Service Coordinated Transport (PSCT) #6 was originally ordered by the Twin City Rapid Transit Company of Minneapolis and St. Paul, Minnesota in January 1945 as car #325, part of an order for 40 cars from the St. Louis Car Company. Twin City Rapid Transit specified extra wide cars (9 feet), with both gongs as well as electric horns, galvanized steel carbodies to help deter corrosion during the harsh winter conditions in which the car would operate, and backup controllers, which are small auxiliary controllers located behind the rear seat for safer operation in reverse. Twin City Rapid Transit had several lines that terminated at wyes, necessitating lengthy operation in reverse. Electrical equipment for this order was split between General Electric and Westinghouse, and this order of cars was built with conductor’s booths for two-man operation. St. Louis Car Company completed the cars as order #1653 in December 1946 and the cars entered service in January 1947 on the “Interurban” line which connected Minneapolis and St. Paul. The cars cost $20,539 each. The new cars were part of a $20 million dollar modernization program at TCRT that would eventually include a fleet of 141 PCC cars. TCRT had planned for streetcar operation for the long term future, but two corporate leadership changes in 1949 led to a decision to rapidly replace all streetcars with diesel buses in less than five years and scrap all streetcar related facilities. This rapid dismantling of the system led to a fleet of nearly new cars being available at a fraction of their original price. Public Service Coordinated Transport, based in Newark, NJ, purchased 30 cars in 1953 “as is” from TCRT for $3,500 per car. The President of TCRT, as well as another company official and the owner of a local scrap firm all were later convicted in federal court on fraud and associated charges related to the rapid dismantling of the TCRT streetcar system. Public Service Coordinated Transport purchased the cars, including #325, for operation on the municipally owned 4.5 mile “City Subway” in Newark, NJ. At one time, PSCT and its predecessors operated trolley lines covering most of the state of New Jersey but started converting operations to bus as early as 1929. The City Subway, originally called the “City Railway”, was built between 1929 and 1935 by the city of Newark in the bed of the abandoned Morris Canal to help relieve traffic congestion in downtown Newark and provide a faster entry and exit to downtown. At one time, five different trolley lines used all or part of the City Subway to enter and exit downtown Newark, but by 1952 only the #7 – City Subway line, operating from the northern edge of the city to Penn Station, remained in operation. PSCT requested the city pave the City Subway in 1952 to permit operation by dual-mode electric-diesel buses, but the city refused and requested PSCT purchase modern railway equipment after an engineering study determined paving of the subway was not feasible. PSCT first inspected the 25 “Brilliner” cars in operation in Atlantic City but were rejected due to the availability of 30 excellent second hand PCC cars at very low prices from TCRT. TCRT Car #325 became PSCT #6 and the entire fleet of 30 cars was placed in service between December 1953 and January 1954 on the City Subway, sending the last of PSCT’s conventional cars, all of which were over 30 years old, to the scrapyard. After the abandonment of streetcar service in Atlantic City in 1955, the City Subway became the last electric trolley line in New Jersey and would remain so for more than 40 years. The PCC cars received excellent maintenance in Newark and received very little modifications over the years. The center window on the left side was modified so that it could be kicked out in the event of an emergency, which was a state requirement for buses as well. The cars retained their original interior configuration including window guards, crank operated windows, arm rests, and foot rests. The backup controllers were eventually disabled and the remaining 24 cars received an overhaul in the 1980s to extend their service life after a decision was made to not to pursue new equipment due to the outstanding reliability of the PCC car fleet. Perhaps most importantly from a long-term preservation perspective, the cars operated entirely on private right of way and were stored out of elements under Penn Station in Newark. Public Service Coordinated Transport was reorganized as Transport New Jersey (TNJ) in 1975 and TNJ became part of New Jersey Transit (NJ Transit) corporation in 1980. Car #6 eventually was repainted from PSCT gray and cream to TNJ red, white, and blue and finally in NJ Transit colors after its overhaul. By the 1990s, the cars and the city subway itself was like a time machine, as the last entirely PCC car operation in North America. After years of studies and plans, modernization of the City Subway to a modern light rail line began in the late 1990s. The line was rebuilt with overhead catenary, and the PCC cars were modified for operation with pantographs. The PCC cars also were used to test new features being considered for the massive light rail cars that would replace them. Car #6 received a new style of resilient wheels in 1997 to test their operation. The end of PCC operation in New Jersey was planned for around 2000, but was later delayed until August 2001. NJ Transit officials decided to repaint one car in 1954 PSCT colors in early 2001 to celebrate the end of PCC car service. After receiving significant body work, Car #6 was selected to receive the ceremonial colors. A gala celebration was held on August 24, 2001, and Car #6 became the second to last PCC car to operate in the City Subway. 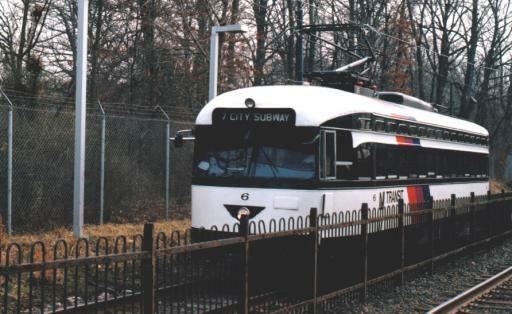 A few days after retirement, Car #6 was briefly displayed in Hoboken, NJ before being placed in dead storage at the new City Subway (later renamed Newark Light Rail) maintenance facility in Bloomfield, NJ. 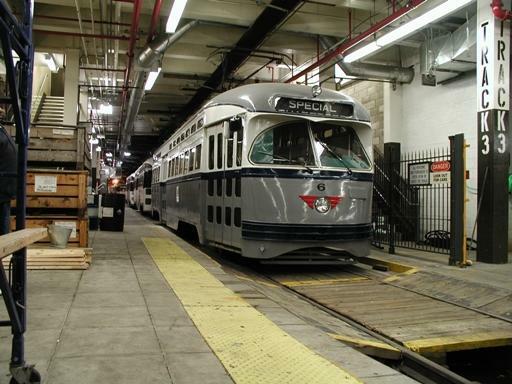 Car #6, along with two sister cars, were selected for preservation in New Jersey based upon the maintenance personnel’s recommendation that it was one of the best three cars. After a number of years in storage, plans for a transportation heritage museum in New Jersey fell through and Car #6 became available for museum preservation elsewhere. 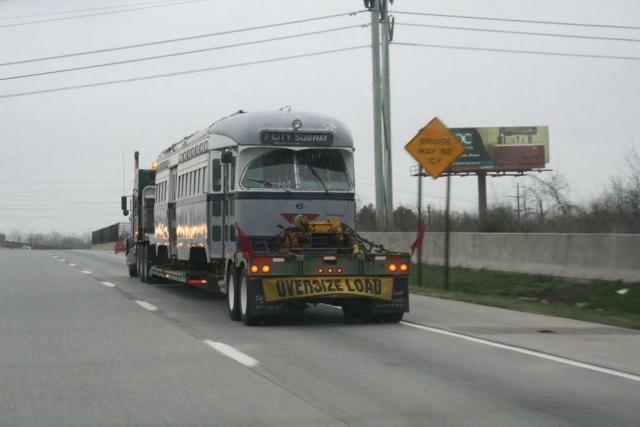 After more than a year of planning, Car #6 was sold to the Rockhill Trolley Museum via the Friends of the New Jersey Transportation Heritage Center in April 2011. Car #6 en route from Newark to Rockhill Furnace, April 13, 2011. 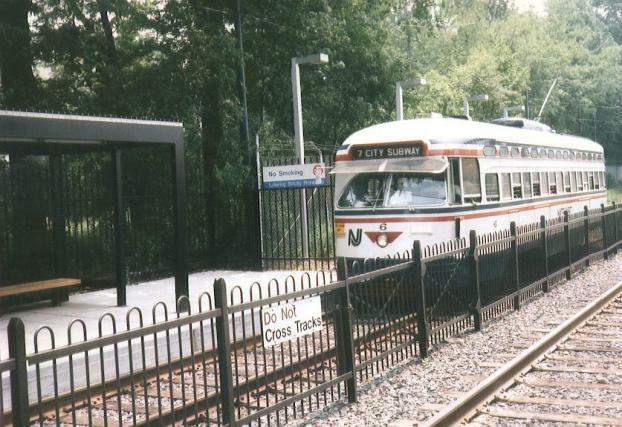 Several PCC cars formerly used on the Newark City Subway are preserved around the country, including #6. Car #27 is preserved by the Branford Electric Railway Association in East Haven, Connecticut. Car #5 was recently acquired by the Seashore Trolley Museum in Kennebunkport, Maine for eventual restoration and operation. Former Car #3 has been restored back to its Twin City Rapid Transit colors and number, #322, by the Minnesota Transportation Museum. Finally, eleven former Newark City Subway cars are owned and operated by the San Francisco Municipal Railway as part of their historic fleet of running cars for service on the F line. Car #6 presents an excellent educational experience to our visitors regarding the development of the electric trolley car. More than 2,000 PCC cars operated within 200 miles of the museum location in Rockhill Furnace, and Car #6 retains most of its original features. Rockhill Trolley Museum is proud to preserve this historic car. To contribute to the acquisition fund for NJT #6, please download the flyer.